While this Chronometer is handy it’s still rather lacking in the information it provides. A drop-in replacement called PADD has been available for a while that provides significantly more data about your Pi-Hole’s activity. While PADD is a huge leap over the built-in Chronometer functionality I felt that it was also a little lacking. Many people run Pi-Hole on Raspberry Pi’s (not surprising given its name), and many people who use Chronometer or PADD use a TFT LCD screen, many of which are actually touchscreens. It occurred to me that a highly customizable text display that leverages the features of LCD touchscreens would be a very powerful tool to complement Pi-Hole. The result of this thought is PHAD, the Pi-Hole Alternate Display. PHAD is a python app that uses the highly popular Jinja2 template engine to make it possible to create custom displays. PHAD also supports cycling between multiple templates by tapping on the Pi-Hole’s touchscreen or on a timed schedule. For more details on installing and using PHAD see the projects README file over on GitHub. 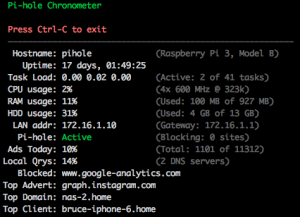 This entry was posted in Linux hacking, Python hacking and tagged pihole on August 28, 2018 by Bruce. I wanted to set up 2 of them, one on my internal network and one on my DMZ, so I bought/configured two of everything. I have a PoE switch and was hoping to use that to power the Pi instead of having an additional power supplies & cables running everywhere. I found this handy PoE splitter that provides the necessary power to the Pi. It’s working like a charm! I was also interested in having a display on the Pi, so I bought a pair of these TFT displays and these enclosures that work nicely with them. To get the TFT display to work you need to install the driver found in LCD-show-170703.tar.gz by following the instructions found here. After the drivers are installed the Pi reboots and the display should start working. 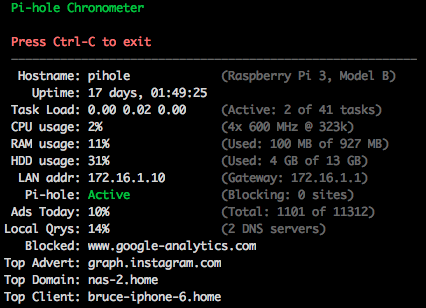 To display the Pi-Hole stats I’m using the chronometer2 script. I like the basic concept of chronometer2 quite a bit, but I felt it could be improved upon slightly. For example, I don’t use my pi-hole as a DHCP server, so the few lines of the display showing it’s disabled is just wasted screen real estate as far as I’m concerned. I would much rather see the top client, top domain, and top advertiser that the original chronometer displays. I also wanted an easy way to be able to restart the chronometer2 display on my TFT display that didn’t require rebooting the whole Pi. When I’m tinkering with the chronometer2 script it’s annoying to keep rebooting the Pi and causing brief DNS outages on my network. The default formatting string is simply ‘abcdef’, so if you don’t specify a custom format string then chronometer2 will use this value, which means the display will look exactly like the one you’re used to. If, like me, you don’t want to display the DHCP details then you would simply include ‘-f abcdf’ on the command line, leaving ‘e’ out of the format string. This will write the PID (process ID) of chronometer2 to the specified file, making it easy to kill the script if you ever need to. chronometer2.sh is run only if the TERM environment variable is set to “linux”. This is what my Pi sets the TERM variable to when running chronometer2.sh locally on the TFT display. When I ssh into my Pi the TERM variable is set to “xterm”, so I’m not greeted by the chronometer2.sh script starting up every time I ssh into it. chronometer2.sh is run in an infinite loop (inside the while/do/done block). So if/when the script dies for any reason it will automatically restart after a one second delay. The script gets its command line arguments by reading them from the file /home/pi/chronometer2.cmdline each time it starts up. So now whenever I want to tinker with the chronometer2 script in any way I just edit the script and/or my chronometer2.cmdline file, invoke the command ‘killc2‘, and after a short pause the script restarts on the TFT display with the new parameters and any other changes I made. My modifications to the chronometer2 script can currently be found here. If they’re merged into the official chronometer2 project I’ll update this to point there instead. This entry was posted in Linux hacking, Software hacking on July 21, 2017 by Bruce.